Space Intruderz Lamps Remind Me Of Something | OhGizmo! By Chris Scott Barr on 06/06/08 • Leave a comment! When I was a young kid, the thing Atari’s glory days were already at an end. I started off with games like Super Mario Bros. And Duck Hunt, however, over time I grew an appreciation for the other games which were a little more difficult to get ahold of back then. One of my favorite older games has to be Space Invaders. I don’t know why, but i just love mowing down line after line of bad guys as they slowly come down at me. Well if you’re as much of a fan as I, you might check out these interesting lights. 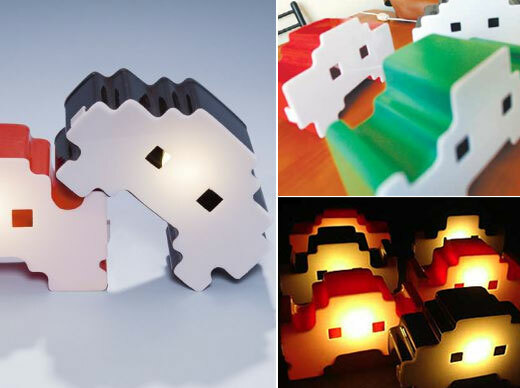 You’ll notice that these lights bear a strong resemblance to the Invaders in that classic arcade. However they are much different, as they are called Intruderz. I doubt that the slight difference in the name will hinder many people from purchasing these. The price of around $50 per light, however, might be enough to do the trick.